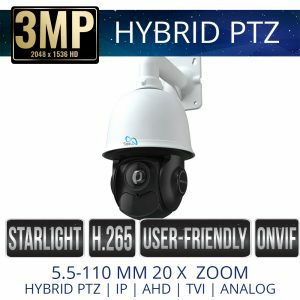 Sibell PTZ Camera HDOC, Pan Tilt and Zoom Security Cameras that are HD Over Coaxial cable. PTZ cameras allow for large area monitoring with the use of a single camera. The Pan Tilt function allows the user to remotely control the viewing area even from Sibell Mobile and the Remote Monitoring options. Experience powerful panning an tilt speeds with 360° rotations. PTZ security cameras quickly move and focus on objects across the scene, zoom features make PTZs ideal for those looking to capture fine details like licence plates and faces and these PTZ work over coaxial cable.